The 2 or 4 hour fire resistant roller shutter is ideal for areas where there is a high risk of fire. The Industrial fire shutter closes automatically when activated via the fire alarm & or a fusible link that will automatically close the shutter once the area reaches 72° Celsius in order to prevent the outbreak of fire from spreading into the adjacent areas. 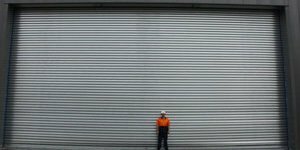 The industrial fire shutter is ideal for underground car parks, shopping malls, supermarket entries, warehouses and office buildings. It is highly recommended where flammable materials are present or in use. Need a quote? Call us today on 07 3802 2999 or send us an online enquiry. We will come on site and provide you with quality advice and a competitive quote.